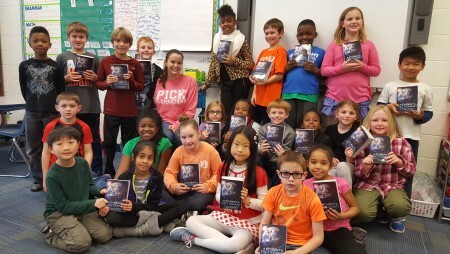 As part of its annual distribution of dictionaries to third graders in Auburn City Schools, members of the Auburn Rotary Club passed out 723 dictionaries during the week of Feb. 6 to students at Ogletree Elementary School, Pick Elementary School, Wrights Mill Road Elementary School and Yarbrough Elementary School. The club's dictionary distribution supports Rotary International's worldwide focus on education and literacy. Pictured here with their dictionaries are students in Anna Gautney’s third-grade class at Pick Elementary School.